My son, Chris, and I share the same dark cloud of disability. His mental illness (MI), mine multiple sclerosis (MS). Who wants to live life waiting for grey skies to clear up? What if they don’t? Does that mean God’s forgotten us? No! Who wants to simply put on a happy face? Wouldn’t we rather feel true joy that radiates on our face? Am I happy about my MS? Absolutely not! But, my physical challenges have caused me to understand the fruit of the Holy Spirit. God’s power enables me to have His joy while enduring longsuffering. It’s a power others have called upon in far worse trials. People like Corrie ten Boom. How could Corrie ten Boom speak of God’s love when surrounded by the horrors of a Nazi concentration camp? The same way Paul and Silas could sing while in prison (Acts 16:25). God’s power inside them, the Holy Spirit, filled them with supernatural joy and peace. That’s the kind of joy and peace I want! Joseph faced betrayal from his brothers (Genesis 37: 23-28) and from his master’s wife (Genesis 39:10, 17-20). But Joseph didn’t become bitter. God prospered whatever he did. Pharaoh even knew the secret to Joseph: the Spirit of God lived in him. Clouds can serve as reminders to us. When we look into the sky, we have a choice. Will we look at the grey cloud or the silver lining? Do we focus on the darkness around us or the Light shining inside us? 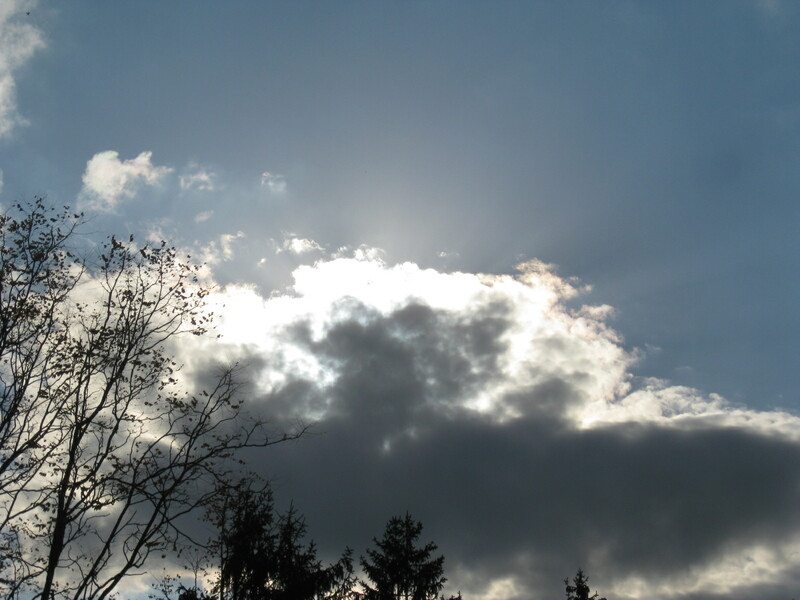 The clouds can remind us of the ‘great cloud of witness’ – the heroes of faith listed in Hebrews. (Hebrews 12:1) Those fellow believers are cheering us on. Telling us we can have joy in spite of our struggles. I am blessed by what you wrote. How inspiring! I am grateful for God’s Spirit. He gives peace and joy in the midst of truly difficult challenges and suffering. I plan to share this with my mother who has Progressive Supranuclear Palsy. I’m blessed by the compassion you have for your mother. It’s awesome to know God’s Spirit can minister to us no matter the disability or circumstances.